Front and middle border. good cut flower. Easy. Remove faded flowers to prolong bloom. Divide every few years to maintain vigor. Coreopsis is always on the list of plants that I recommend for those new to perennials. It is easy to grow, very hardy, long lived, and has an exceptionally long bloom period - from early summer right through fall if faded flowers are removed before they set seed. The flowers are excellent as cuts, lasting up to a week. Flowers are bright yellow, semi-double and daisy-like. 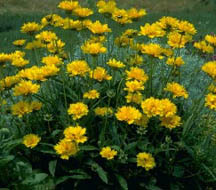 Coreopsis will tolerate just about any soil as long as it is not water-logged. It is quite drought tolerant. Give it at least 5 hours of full sun a day for best flowering. Plants can go for 5 to 6 years before division is needed, though more frequent division can be used as a means of increasing supply. Space new plants 16 inches apart. Coreopsis will also self sow quite readily, and most cultivars will come fairly true.